There's a really good chance you've heard about bone broth and maybe even listened to your friend swear it's changed her life. 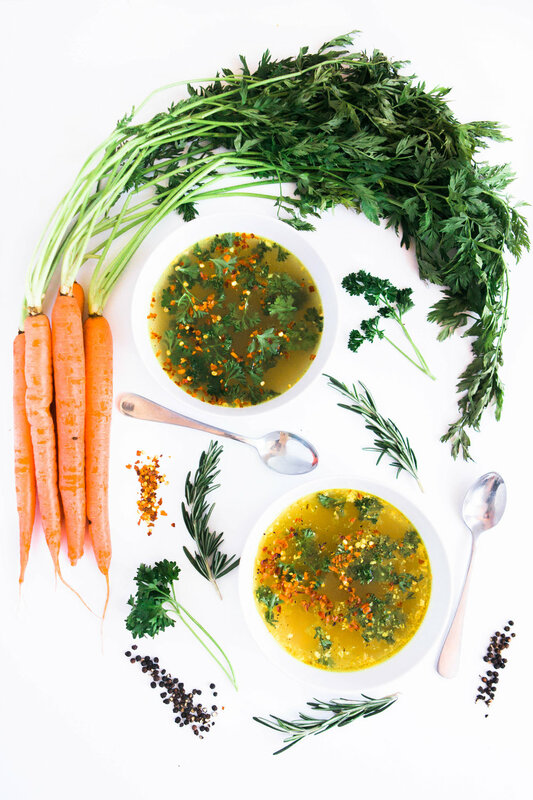 Well your friend probably isn't exaggerating, because bone broth is kind of like magic. Maybe I'm being a little dramatic. Maybe I'm not. The main reason I started to drink bone broth was for it's gut health benefits, which you can read about here, and I have definitely reaped those benefits! I also love making bone broth because it reduces waste. If I wasn't making bone broth, I would literally just throw the bones. By making my own bone broth I also eliminate the need to spend money on chicken broth for soups. Instead of forking over $3 ever time I want to make a soup that requires chicken broth I just reach into my freezer. And now those bones that I would have otherwise thrown out have served a purpose and saved me money. It's also important to note that most store-bought "broths" are mostly artificially flavored and aren't doing your body much good. If you can't pronounce the ingredient list, it's probably not serving your well. 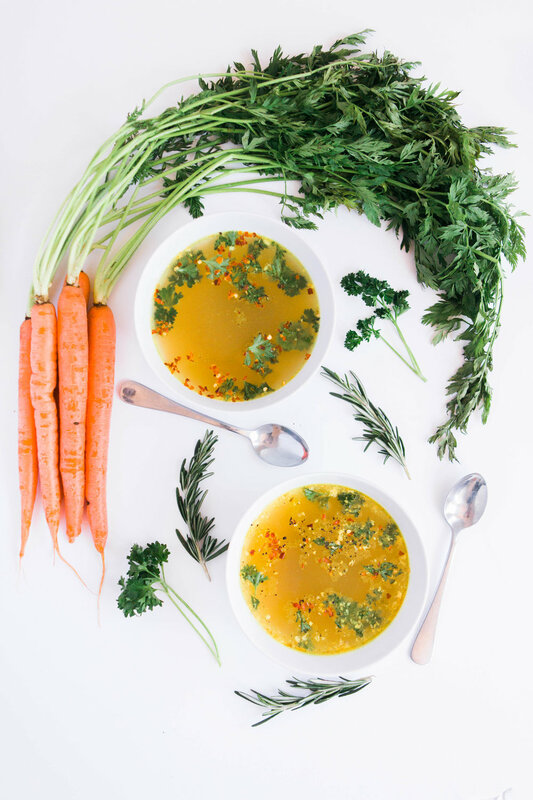 Bone broth is nourishing and satisfying all on its own. Sometimes I'll drink a cup of bone broth and call it lunch, especially in the winter when I will take all the cozy vibes I can get. Sometimes I throw in some roasted veggies and shredded chicken for a more filling meal. It really depends on my hunger level. If you've never tried bone broth before, give it a shot. It's likely to become a new staple in your life. Put the bones in a large pot (at least 5.5 quarts). I use this one. Then fill the rest of the pot up with filtered water. Add the rest of your ingredients and bring to a boil. After it boils, bring it down to simmer for about 20 hours. You can also use a slow cooker if you are not comfortable leaving your stove on while you are sleeping. To store, let the broth cool completely and then divide up into into mason jars. It will keep in the fridge for up to 3-4 days or the freezer for a year. When you take the broth out of the fridge it will look kind of like jello until you heat it. If this is not the case, read this article to see why your bone broth didn't gel. The most nutritious bone broth will have that jello consistency because that means you are getting the gelatin (cooked collagen) which is the biggest benefit of drinking bone broth. *I roast a whole chicken and then take all of the meat off and just use the bones to make this bone broth. **Optional, but I love the color it adds and the earthy flavor it brings. Feel free to experiment with different flavor combinations. The vital components in this recipe are the chicken bones, apple cider vinegar, and water. Other than that, choose the flavors you love and use whatever you've got on hand.